Here's the thing about when wedding planners get married themselves: they know what's actually important to them, what they actually like, and they just do it. And in Alli's case, she did it really, really well! Alli, today's bride, is the owner and planner of Alli Mae Fresh Events. She's this tiny little bundle of energy and creativity and I can't say how much I loved being a part of her wedding to Dan this spring! It was one of my first weddings of the spring, and I was so pumped to kick things off on such a colourful note. Alli wanted rich, vibrant colours (you absolutely don't need to be afraid of colour, friends! ), everything took place at the Winnipeg Art Gallery (this space is my new favourite in the city, hands-down), and they had a totally relaxing, enjoyable, and fun day. She planned it perfectly! Oooooh, Alli's bouquet. It felt so good to make this. She's a tiny person so while this bouquet looks pretty big on her, it was actually smaller than most of my other bridal bouquets. It was well-proportioned :) I just loved all the colour - we decided on mixed pinks, peaches and corals with a 10% hit of vibrant orange. You don't need to go all the way with colour to make a big statement! Bridal bouquet ingredients: coral peonies, peach roses, garden roses, viburnum, tulips, ranunculus, and hyacinth with mixed greeneries. Alright, this ceremony set up is my new favourite - of all time. Designing these vertical gardens was a challenge, but one that I loved. I spent weeks trying to figure out the best plan for the structure itself, sent my husband to Rona to get all my supplies, and when he walked back in the door I had figured out another plan that allowed me to use stands that I already have 🤦🏼‍♀️ And they worked great! Basically, I created these tall greenery pillars and then fed the flowers through them. 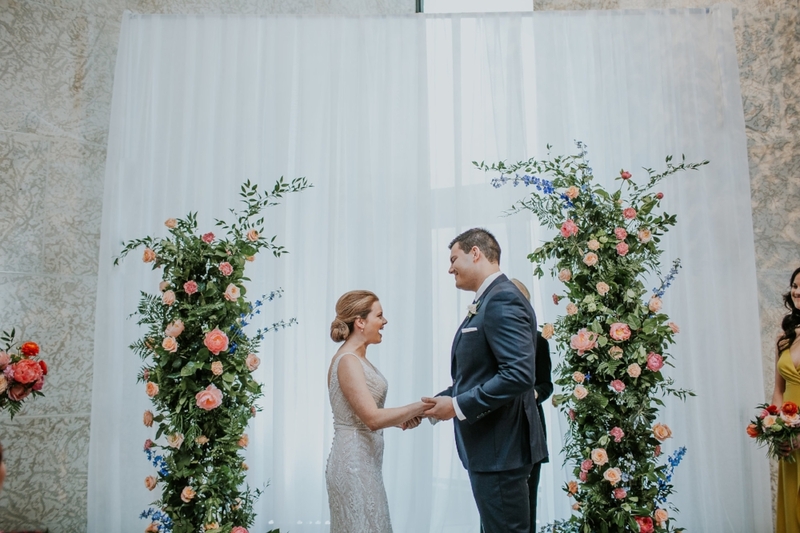 The one of Dan's side was about 8 feet tall and the one on Alli's was about 6 feet tall, so they were a major visual focal point. They planned for a more cocktail style reception, with mixed full size round and rectangular tables and cocktail size tables, all in the same space as the ceremony. They shifted the chairs over and pulled some tables out from the back when the ceremony was completed, adding space for a dance floor (highly necessary, considering they had Big City All Star Band!! ), and created separate spaces with panels of drapery. It really looked SO good. And I LOVE those blue linens! We did a mix of large centrepieces in gold vases with stem vases and smaller arrangements. It was all completely with eclectic candleholders, personalized napkins, and pretty signage! I can't tell you how much I love that they used the ceremony backdrop as the backdrop for their cake and desserts. This table just feels so vibrant, fun, and fresh. I love it! Alli, thank you so much for trusting your wedding flowers with me! It means so, so much to me whenever a wedding vendor puts their trust in me for their celebrations and it was such an honour to be a part of this wedding.